I can't believe tomorrow is Thanksgiving already! Where has November gone?! I have a few blogkeeping items I need to take care of, so I thought I'd do it today before I take a blog break for the Thanksgiving holiday weekend. First of all, I received two blog awards recently. I was passed the One Lovely Blog Award by Glenys at Glenys Leeng. 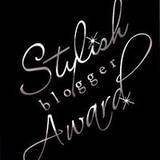 I was also passed the Stylish Blogger Award by Erica at B is for Boy! Thanks so much Glenys and Erica! I am really honored. Please check out what these blogs have to offer. I continue to be amazed by the talented people I run across each and every day. And please go check out Glenys and Erica's blogs. You definitely will be glad you did! In addition, the Stylish Blogger Award requires that you share seven things about yourself. I think I can handle that. I don't drink coffee. At all. I don't like it. I love the smell of it, and I like coffee flavored desserts, but I don't like the taste of straight up coffee. I drink Pepsi like it's my job. I love math. Really. Like calculus and trig and all that jazz. I've been to 48 of the 50 states. I haven't been to Washington or Alaska. Yet. I watched the very last Bob Barker hosted Price is Right while lying in a hospital bed in labor with my oldest daughter. 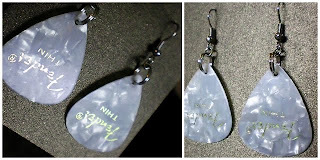 Next item of business is these lovely earrings that I won from a giveaway over at just Lu. ﻿Aren't they the cutest? Lorene did a great job making them... it's such a clever idea. She'll be over here next week with a guest post tutorial for Haul Out the Holly. I also won another giveaway just days ago, but I'll wait until I receive my goodies (all the way from Australia!) before I tell you about them. Another item of business is the handmade label/tag tutorial I've been promising you. Unfortunately I didn't get to it before Thanksgiving. I'm going to work on it and have it ready for you as soon as Haul Out the Holly is over. Be looking for the tutorial around December 13th. I hope everyone has a safe and happy Thanksgiving! I'm taking a little blog break to enjoy some time with my family and to prepare for the big blog event that starts Monday. Can't wait! I don't like coffee either, but Love the smell! Was that your parents' car and they passed it down to you? LOL We call that a "grocery getter" in my neck of the woods. Love your guitar pick earrings. :) My hubby plays the guitar so we got a lot of them lying around the house. I hope you have a great Thanksgiving! Looking forward to seeing all the guest post for Haul out the Holly! You lucky duck! Winning TWO giveaways? I never win ;) That's okay, I'm glad someone out there does! Hi Gwen, thank you for thinking of me! As we speak your winnings are winging their way towards you. Happy Thanksgiving, have a wonderful holiday with your family...and lotsa turkey and...not so much coffee!!! Hi Gwen, Happy Thanksgiving!!! I'm sorry I didn't get by sooner to visit. It's just been so crazy here. Yeah, I love entering contest. Those earrings are so cute. And I've been checking out your post and those coco coozies are really cute! Oh' and congratulations on your new awards! Thank you for thinking of me :)! Congrats on the win, love those earrings! How cool that you've been to 48 states. Thanks so much for mentioning my blog! I love reading yours, you are so crafty! Hope your Thanksgiving was great! ps whats up with this haul out the holly party? Thank you so much for the mention, lovely Gwen. Hey, I love maths too! I think maths and sewing go well together! Plus my favourite flavour is cookies and cream as well. Were we separated at birth? Spooky! !